I have been doing this for over 10 years now and just when I think I have seen New York Ranger prospects doing something special then someone else comes along and tops that. Anthony Duclair (NYR 2013 3rd) has done something that no other Ranger prospect has done and that is win back to back player of the week honors by his league. This is also the 3rd time this season that he earned the first star by the QMJHL. If that was not enough Duclair added the "Telus First Star of the Month" for January to his already solid season. This following the Second Star which Duclair was awarded for December which again is a first for a Ranger prospect. BOUCHERVILLE, Saturday February 3rd, 2014 - Anthony Duclair, Sébastien Auger and Jonathan Diaby were named today the TELUS three stars for the month of January. The first star of the month is the Quebec Remparts’ forward Anthony Duclair. In 12 games, Duclair collected 28 points, including 14 goals. He had a career best offensive performance in the League on January 30 against the Halifax Mooseheads, with 7 points in a 8-2 win. The New York Ranger’s third pick is the QMJHL's best scorer with 45 goals. 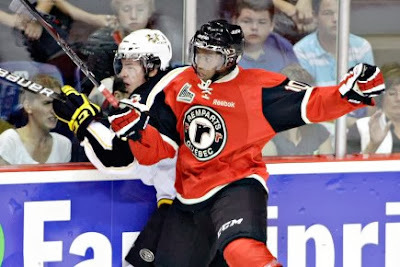 The Remparts won 10 out of their 12 games during the first month of the year. The first star of the week, for the second consecutive week, is the Quebec Remparts’ forward Anthony Duclair. In two games, he tallied 10 points. Thursday against the Halifax Mooseheads, Duclair got a career-high 7 points in a 8-2 win. That is also a QMJHL high this season. With 85 points, Anthony is only three points away from the League leader, Anthony Mantha. What makes what Duclair has done even more special is that Duclair got his torrid scoring streak going after he had signed his NHL Entry Level contract with the Rangers. In about 90% of the times a prospect signs his first contract then he tends go on a slump as he tries to justify his contract. Give Duclair some serious credit as instead, Duclair played even better after he signed his Ranger contract.